Computer graphics (or CG) has changed the way we experience the art of moving images. Computer graphics is the difference between Steamboat Willie and Buzz Lightyear, between ping pong and PONG. It began in 1963 when an MIT graduate student named Ivan Sutherland created the first true computer animation program. Instead of presenting a series of numbers, Sutherland's Sketchpad program drew lines that created recognizable images. Sutherland noted: "Since motion can be put into Sketchpad drawings, it might be exciting to try making cartoons." This book, the first full-length history of CG, shows us how Sutherland's seemingly offhand idea grew into a multibillion dollar industry. In Moving Innovation, Tom Sito -- himself an animator and industry insider for more than thirty years -- describes the evolution of CG. The history of traditional cinema technology is a fairly straight path from Lumière to MGM. Writing the history of CG, Sito maps simultaneous accomplishments in multiple locales -- academia, the military-industrial complex, movie special effects, video games, experimental film, corporate research, and commercial animation. His story features a memorable cast of characters -- math nerds, avant-garde artists, cold warriors, hippies, video game enthusiasts, and studio executives: disparate types united by a common vision. 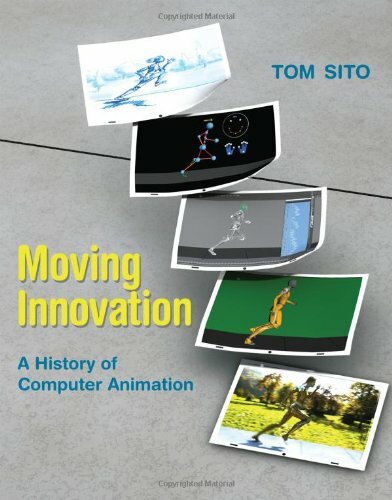 Computer animation did not begin just with Pixar; Sito shows us how fifty years of work by this motley crew made movies like Toy Story and Avatar possible.